I love the man's smile as he watches the two young kids ride past. 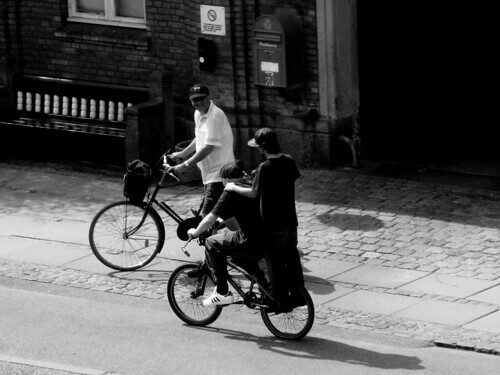 Sums up the simple pleasure of cycling in Copenhagen. I read an article the other day about how the sale of Bio-hybrid cars is booming in Sweden. There has been an increase of 103%, since April 2007, in sales of cars that run on more environmentally-friendly petrol. The Swedish government offers an 8000 kroner discount if you buy one of the cars, so that has probably helped boost sales. The most popular models are the SAAB 9-3 Biopower, Volvo V70 Flexifuel and V50 Flexifuel. I read alot about this oil crisis in America and I recall a statistic about how more bicycles were sold in America in 1976 than cars because of the oil crisis back then. Let's hope bike sales increase again now and that people actually ride them. While oil prices are higher than normal at the moment here in Europe, they are not drastic. The price of oil is pegged to the dollar and since the dollar is so low against the euro, we don't really feel the pinch. I was interviewed by an Irish journalist the other day about Copenhagen's bike culture and what have you. One of the questions was about government cycling brochures and adverts. In Ireland, he told me, all the photos on such literature feature cyclists with fluorescent vests and helmets. 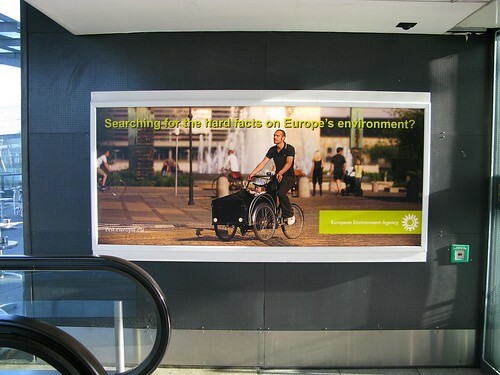 Here's an advert [above] that I saw at an airport, for the European Environmental Agency. It reflects the bicycling life for millions of Europeans. The good news regarding Ireland is that urban cycling is up 17% in Dublin since last year, due largely to a new tunnel for heavy vechicles so that they avoid the city centre. Great news! I met with this lovely chap the other day. Richard from Vancouver. He is involved in bike advocacy on a municipal level and is part of the BC Bike Coalition. He's on a research trip around Europe we hooked up on the city hall square and cycled off for a beer to discuss our segregated bike infrastructure and all manner of things related to bike culture. Exchanging observations and experiences, stats and numbers. It was a lovely meeting. Richard had, of course, rented a bike for the duration of the journey. If you come to Copenhagen and need a bike, it'll probably end up looking like this one. Nice to have met you Richard! It was a pleasure.